What is break statement in C#? What is the functionality of break statement? 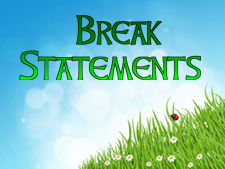 How to use break statement in programming? The break statement is used to terminating the current flow of the program and transfer controls to the next execution. In this chapter you learned what the break statement is in C# and how to use it in program. In next chapter you will learn about continue statement in C#.